Even if you’re not a fan of garlic you may want to give pickled garlic a try. Pickling mellows the garlic more than you might think. Pickled garlic goes well with cheese and crackers or spiced meats. 2 x 250-300ml jars with good lids. Separate the bulbs of garlic into cloves and peel. In a saucepan bring the vinegar, salt and sugar to the boil, stirring occasionally to make sure the salt and sugar are dissolved. Add the garlic cloves to the pickling liquid. Bring it back to the boil and simmer for five minutes. 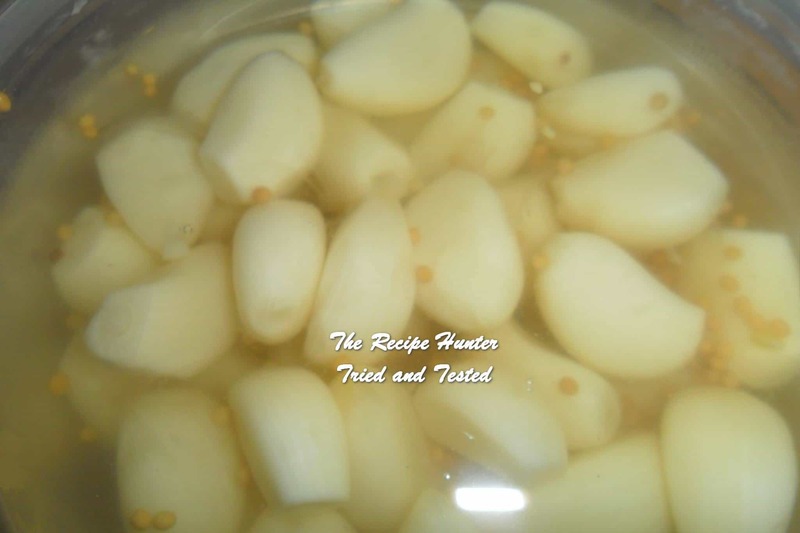 Transfer the garlic cloves to sterilised jars. Add the mustard or fennel seeds if using. Carefully fill the jars with the hot pickling liquid. Seal. The garlic will be ready to use in about a week, but like with most pickles, the flavour improves over time. I have made these using both fennel and mustard seeds and there really was nothing to choose between the two. Also if I can get ready peeled garlic it does save time.